The proposal, the first center for higher education and learning in Diu aims to establish a new educational landscape enabling an exploratory, experiential environment inspired pedagogy. 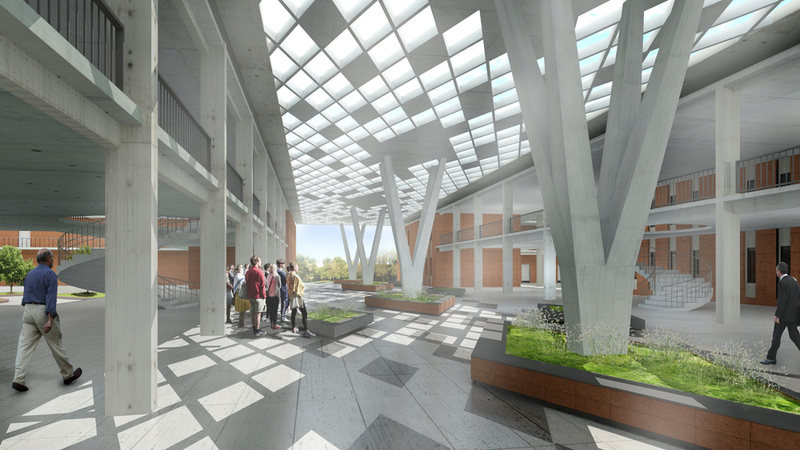 The design of the new education hub is conceived to create a network of interaction spaces / courtyards to encourage and provoke interaction between students / faculty. The ground level is kept porous and fluid for flexibility in movement. The spatial parameters are set laying the entire programme is three distinct zones, the public, the academic and the landscaped play areas, the formation of sequence of various green squares/ courtyards and the definition of the various zones is identified by the materiality and treatment of the façade. A major component in the composition of the building blocks is the auditorium in the south-west corner. This is intended to act as the main visual focus and the set a visual landmark for the entire campus owing to its close proximity to the main road. The site sitting on the existing wetland poses many challenges. The proposal aims to makes these challenges to opportunities in many ways. The water body is exploited as an outdoor ecological lab exposing the students to natural habitat of the wetlands and making it a part of the landscape. The water level is controlled to stop flooding during the high tide and allow the natural habit to flourish. It also provides evaporative cooling combined with the land breeze / sea breeze. The proposal intends to preserve and enhance the key elements of wetland landscape and the overall greenery. In addition the functions as an academic hub, the campus also addresses the community functions whole revaluation impacts positively the immediate and the surrounding areas. The auditorium, the library and the canteen aims to serve as a new public space for the whole of Diu. These functions are positioned in the front with large green spaces around it. These are intended to also function independently without interfering with the academic blocks. Being located in the heart of Diu this hub aims to bring about a new change in bringing the local societies closer.